(Text automatically translated) Sofa bed in the living room. Car parking in the garden. Gas and electricity 'to be paid extra during the months from October to May (? 0.95 per cubic meter - ? 0.35 Kwt) TV available if required. TERMS AND CONDITIONS To confirm your reservation we require a deposit of Euro 150,00. Upon arrival (turn-key) the rest of the amount must be paid together with the deposit of Euro 150,00 and payment for any of linen rentals. Cost final cleaning Euro 30. If you cancel your reservation within the twenty (20) days before your arrival you will be charged 60% of the weekly cost. In the event that the customer cancels the reservation, the deposit will not be returned. The tenant undertakes to occupy the dwelling following all the rules of good neighborliness.COMPLAINTS If on arrival to accommodation during your stay or if something happens that does not meet expectations, please call the phone numbers already have to give us the opportunity to resolve them as quickly as possible and with mutual satisfaction. IT'S NOT ALLOWED the use of blankets, cushions, pillows, chairs etc.. in the garden or on the balconies otherwise we will retain all or part of the deposit for extra cleaning. It was a nice time in this house. But sometimes we missed some kitchen equipment. 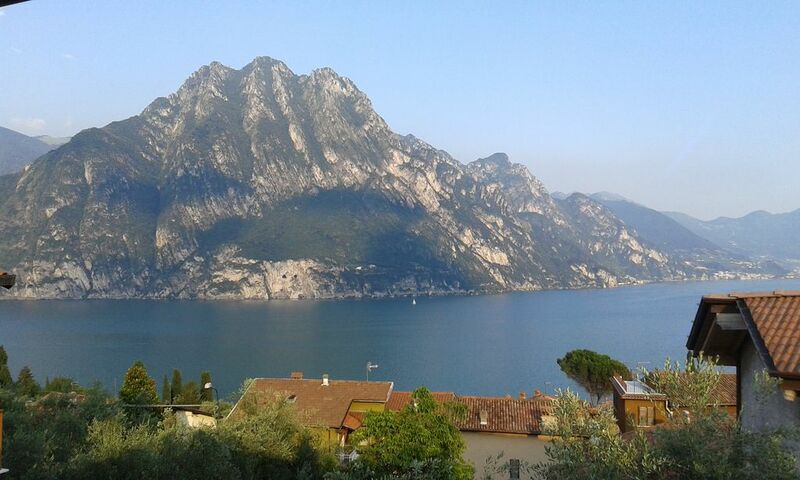 "ULIVI is the beautiful place and very nice sight to mountains." "very nice apartment in quiet rural location nice for quiet getaway"
"A large and clean apartment with a beautiful view of the lake. The property owners were very helpful, even with our late arrival, and we enjoyed being close to Bergamo, Milan, the mountains, and even Lake Como at only 2 hours away. We'd definitely stay here again!" "Very peaceful location but out of season a hire car is essential as a lot of the amenities close down for the winter. Very clean apartment." (Text automatically translated) Take the motorway A4 Milano-Venezia exit BERGAMO hen and follow the road SS42 Lovere-Vallecamonica for about 30km and in the locality Piangaiano take the road to Solto Collina and then continue towards Riva di Solto. If you come from VENEZIA-MILANO exit in PALAZZOLO and take the road to Sarnico, Tavernola and Riva di Solto then up the hill to Solto Collina and after about 300m there is Via I° Maggio on your left. Excellent shopping and cultural activities easily accessed in nearby Lovere, Bergamo and Brescia. Ideally situated for walkers, road and mountain bikers or those simply looking for a relaxing country retreat. Richiesto supplemento per il riscaldamento in base alla stagione, Deposito cauzionale, Caparra richiesta alla prenotazione, Consegna delle chiavi da parte del Proprietario non presente in loco. Informare in anticipo il proprietario se si desidera portare un animale. TASSA DI SOGGIORNO DI EURO 1 PER PERSONA DAI 14 ANNI PER I PRIMI 7 GIORNI DI VACANZA RICHIESTA DAL COMUNE DI RIVA DI SOLTO DA PAGARE IN CONTANTI PRIMA DELLA CONSEGNA DELLE CHIAVI.